A source present during the recent militia ceasefire consolidation meeting in Zawia was able to divulge anonymously some of the details of the meeting. He was able to reveal the mood in the room and give feedback on the vibe of the meeting. The reliable source felt Ghassan Salame was serious, open and frank in his deliberations with militia heads. He revealed that Ghassan Salame said that UNSMIL was aware which militia was responsible for the two shells that fell after the first ceasefire meeting on the Arada district of Tripoli. He warned those responsible that he considered this to be the last warning to all who break the ceasefire agreement. He warned that next time he will publicize the name of any militia that does not respect the cease-fire and puts civilians at risk and that they will be subject to international sanctions. Salame then pulled out a handwritten piece of paper from his pocket and said this was a pledge by the four main militia brigades in Tripoli not to attack state institutions which the source understood to be the Tripoli Revolutionary Brigades (TRB), Nawasi, Bab Tajura and the Ghenewa brigade. Salame then read the 8-point ceasefire proposal, which was published yesterday by UNSMIL. The source said that everyone pesent at the meeting indicated their acceptance of the proposal. Salame had indicated that the 8-point plan was seen on the same morning and strongly supported by the Faiez Serraj government. Interestingly, the source said that Salame stated that in prnciple he supports the demands of the Tarhuna-based Kani 7th Brigade and the tribes of Tarhouna, but that he did not agree with the violence they used to achieve it. 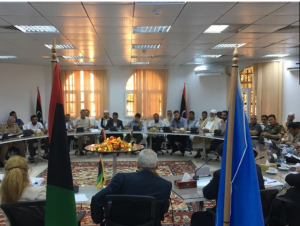 These demands are that the militias withdraw from Tripoli and stop interfering in politics and stop coercing state institutions into giving them letters of credit. Salame went on to say that he was aware that Libyans were dissatisfied with the militia infiltration of the capital and their influence on decision-making. He said that he had reported that to the Security Council in his latest briefing. On the accusation of rife corruption in Tripoli, Salame said that there were corrupt “Ministers” in the Serraj-led Presidency Council and Government of National Accord. They were so corrupt, he said, that their “smell of corruption has reached Europe”. He said that UNSMIL will ask for their “removal”. Probably with Lebanon and Beirut in mind, Salame talked a lot about the similar experiences of other countries and advised militias to avoid the capital and the possible scourge of destruction. Prophetically, speaking before the terror attack on the National Oil Corporation’s Tripoli headquarters, Salame mentioned that there was information about terrorist infiltration of Tripoli. He urged and advised everyone to overcome their differences and stand against terrorism, which he said did not distinguish between anyone. On the latest political situation in Libya, Salame said that he supported reconciliation but that he would not cling to any particular “names”. This could be taken to mean that the international community had no particular candidate to lead Libya forward or that Faiez Serraj was now deemed dispensible. Salame added that he was waiting to see what will be decided by the House of Representatives and the High State Council and that UNSMIL will support what the Libyans decide , either by naming a new 3-member Presidential Council and a separate government or any other option that contributes to the stability of the country. He added that UNSMIL had organized a meeting between Tripoli Central Bank of Libya (CBL) Governor El-Kabir and the Beida CBL Governor Hibri. He said that they were in the process of taking serious measures to unify the CBL which was interrupted by the recent security problems. Salame said that the causes of the recent conflict were economic and that he could not remain silent on the current situation of economic collapse in Libya. To this end, he said that UNSMIL was determined to support Libya as soon as possible to adjust its exchange rate and stop the bleeding of its subsidies. As for the deliberations of the militia heads, the source reported that there were some petty verbal quarrels between them that were not worthy of taking place in front of UNSMIL. However, the source, who does not share any allegiances or connections to him, was impressed by the performance of Major General Osama al-Jwaili who he said lived up to his role as a mediator and who the source felt had a big role in the reconciliation between all the warring parties.